Receiving an e-mail or call from satisfied customers always makes for a nice day. 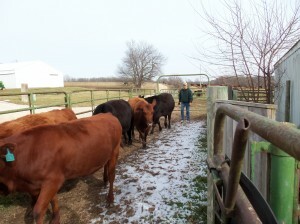 Doris and her husband farm in Kentucky and installed a new grazing system last summer. We discussed the fence several times and she had sent me photos of the project as it was being built. Though they had never built a fence using hi-tensile wire they ended up with one that would have made a contractor proud. Doris sent me the following e-mail today after she had a little difficulty getting a round bale to unroll. You may remember me from last year. 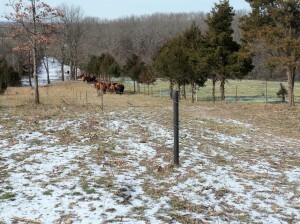 We installed almost 2 miles of fence using your Pasture Pro posts and were thrilled with the outcome. I sent you pictures of our installation process, but probably hadn’t talked to you since. Well, I have a story from this weekend. My husband was out of town and my daughter and I were unrolling hay down the hills for the cattle. We were still trying to determine if we had the bale turned the right way to unroll, just as a contractor pulled up to look at a job for our new barn. In a hurry, we decided all was well and turned the bale loose to unroll down the hill. As luck would have it, it did not unroll very much before violently plowing into the fence at the bottom of the hill. The contractor had a big laugh and offered to help me fix the fence before my husband returned. I just laughed and said, “No problem, the fence is fine! Pasture Pro posts bend and spring right back up!” It could not have worked any better. I thought you might enjoy seeing this picture that clearly shows I rolled the bale (all-be-it unintentionally) over the fence – no harm done. In the end, I did actually have the bale turned the correct way, but it was compacted so tightly that it simply didn’t unroll before hitting the bottom. Now, naturally I would have been more careful if I weren’t in a hurry with this contractor waiting on me, but I was definitely relieved that this mistake ended so nicely. Even though you did have the bale turned the right direction after all I know the feeling. I’ve been rolling out bales for 25 years and still have difficulty figuring out which way to unroll the bale. I wonder why a company hasn’t come up with arrows printed on the bale net to show the right direction .. Thank you Doris for sharing your story with us. In an earlier blog I described how Judy and I have used the guidelines from the book- The Lasater Philosophy of Cattle Breeding- to make decisions for developing our herd of mama cows. 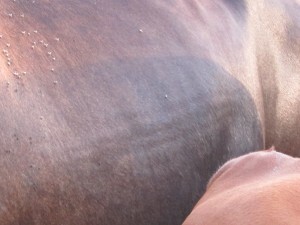 http://www.pasturepro.com/blog/2011/07/building-a-cow-herd-with-beefmaster-and-south-poll-genetics/. Essentially it makes the case for having a few, ironclad rules that favor fertility and adaptability under your farm/ranch management system. We found this to be a great way to build a herd of cows adapted to our farm–but it means you need to keep a large number of home raised heifers for breeding. This is especially true in the first years of the program for quite a few cows will be open at pregnancy checking and need to be sold. We turn bulls in July 4th and leave them in 45-55 days, meaning they are often reproducing in very hot and humid weather which can lead to reproductive failure for unadapted cows. We found out in a hurry that open cows sold after preg checking in December were selling on the lowest market of the year for slaughter cows. Not only that, but often the open cows are heavy milkers and thin–the reason they are open! We knew we had to find a better way to market these open cows to take advantage of the easy weight gain these dry cows put on and increase income at the same time. We began turning bulls back in with the herd on Thanksgiving day to get the open cows pregnant with a fall calf and then sell them as bred cows anytime from May to August. The first couple of years we sold the fall calving cows we thought of and described them as our “cull” cows. Now, instead of culls, we have a complete dispersal of our fall calving herd-every year. 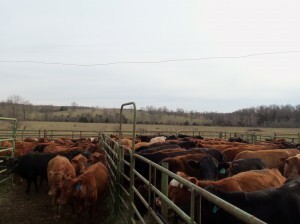 We have increased the price received over selling an open cow by $200 to $500. These fall calving cows have done very well with other producers and we now have a good demand for our fall calving cows and are able to replace cows with adapted heifers that are easy keeping and will breed in our summer window. 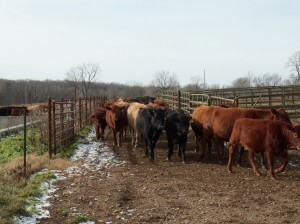 Burke Teichert writes a column on beef management for BEEF magazine that I look forward to every month. Here is a link to an in-depth article about culling cows and keeping replacement heifers that I particularly enjoyed..
Last year PasturePro posts were approved by the Washington State Department of Agricultural for use in organic operations. WSDA is one of the few USDA certifiers in the country [OMRI being another]. You can view the certificate of registration here or see the WSDA published list of approved products. You will find us listed in approved products under the name Green Forest Composites LLC. 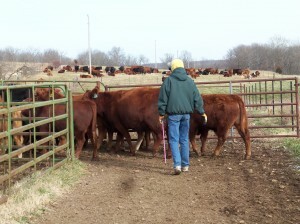 Fence-line weaning calves has become much more common in the last few years. We’ve been weaning calves this way since 1987. We didn’t discover this method by study and research, but by cows and calves busting loose the first night of weaning and ending up next to each other on the opposite side of a woven wire fence. Since we weren’t sure we could get the calves back to the weaning pen without a great deal of work and seeing how calm both groups were lying in the field, we decided to leave them on grass right where they were. It worked so well we just kept on weaning this way. Over the years we’ve weaned thousand of calves using this method and can count on one hand the number of calves we’ve had to treat for sickness. Here are few photos of weaning day last week. This isn’t very exciting but I enjoy seeing how other producers do things on their farms and I hope you do as well. The cows were close to two miles away on this cold, grey Missouri morning. The above picture shows a new lane (and our new boss post!) we built to help bring the cows through some pretty wild country. I lead the cows and Judy brings up the rear. The cattle were full this morning and in no hurry. The cows, at this point in the drive, were spread out close to a mile. They were all walking, but some walked faster than others! Made it to the pens! Our pens are located in the center of our farm so we make it a habit to bring the cows through the pens as we move them from pasture to pasture. Some days we’ll lock them in for an hour or so just to let them become used to being there and not feel they will always be worked when the gates are shut. If you look over Judy’s shoulder in the above photo you’ll see about 100 pairs out on pasture. Our pens hold can hold about 250 pairs but we’ve found that if we keep no more than 100 head in the pens it’s a lot less stress on everyone. 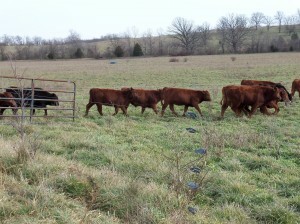 Then as the 100 are worked they go right back out on pasture and we bring in the next 100 head. This way no one stays locked up for very long. We use a cutting gate (my job) but between Judy’s ability to sort in the pen and the cows learning the system there are very few times the gate has to be used. One of our goals is to see how many cows/calves continue to chew their cud while we carry out the sorting. The calves had been worked three weeks before weaning. Today they will just be sorted and taken back to pasture, but with a fence between them and their mothers. They don’t seemed to be too worried about being in the pens again. After each group is sorted we lead them down to pasture-cows on one side of the fence and calves on the other. Cattle are off grass for less than an hour. We’re two days into the weaning process and the bawling is about over. I didn’t take photos of the calves and cows on pasture but will try to post some this week. This system of weaning really keeps the stress low and the calves gaining right through the whole process. Where in the (Fencing) World is Gary Duncan? Our friend, Gary Duncan, who has been with PasturePro almost from the beginning, has taken a new job and for the last few months has been selling PasturePro posts, along with many other electric fence products, for Kencove Farm Fence. When I learned about the job opening at Kencove I thought it a job that would be a good fit for both Gary and his new employer. After I spoke with the GM at Kencove, I told Gary of the job opening and my feelings that this may be a terrific opportunity for him. Kencove, one of the largest and oldest retail catalog/internet power fence companies in the country needed a knowledgeable product specialist located in the midwest as they had recently added a store in Missouri. If you’ve been a customer of Gary’s you know how much he enjoys his job, explaining and discussing the fence products he provides. When Gary recommends a product you can be sure it’s a product he believes you should use and more than likely one he has used on his own farm. Kencove gives Gary the opportunity to provide to retail customers his large knowledge of fence products and construction while selling the entire spectrum of fencing. We’ve been fortunate to have Gary working with us at PasturePro the last few years and Kencove is lucky to have him now. While we miss Gary, I can tell you as as Gary’s friend and colleague, it pleases me a great deal to know Gary has found his almost “perfect” job. This is one of those unusual opportunities where everyone involved is pleased with the outcome. Thank you, Gary, for the support you’ve given all of us at PasturePro and we wish you all the best in your new venture with Kencove. I first learned about using lead steers to help manage stockers back in the early 90’s from Dr. Gordon Hazard, the renowned grazing farmer from West Point, MS. Listening to his presentation that day, I learned how having a lead animal that is extremely calm and willing to follow you anywhere is a tremendous asset when bringing in new stocker calves or weaning your own farm raised calves. One thing Dr. Hazard stressed is that you don’t pick a lead animal, he picks you, and after having three different lead animals since that time, I will second that statement. Attending a dairy grazing conference last year in Virginia I was listening to a veterinarian for one of the organic grazing coops speak about healthy cows when he pointed out a cow with “happy lines” on her. While the cow wasn’t smiling she did look very healthy and happy. Slick, shiny hair coat and with that nice contented look in her eye all good stockman like to see, and, as the vet pointed out, a string of horizontal lines across her rib cage. He said this was a sign of a cow well in tune with her environment and something we should strive to see in a majority of our cows. Not being a dairyman, I thought this must be a dairy cow phenonemen, but looking at my fellow attendees, mostly dairyman, I realized they too had just learned something new. Before I could raise my hand to ask more questions the vet was off on another subject while I sat and thought more about this new insight. Back at the motel I googled “happy lines in cattle” and came up with little more information than what I had just heard. As soon as I arrived home I went out to look among our herd and was pleased to see well over half carried the “happy lines” mark. So now I really wanted to believe the vet was correct for we always want it to be accurate what we want to be true! Judy and I have noticed it’s not always the fattest cows that have the marks, but it’s only in cows that have a real healthy sheen to their coats. If this is a true marker it would be a terrific way to gauge your forage and mineral program. Sure would appreciate any feedback and input on “happy lines” as it would be nice to know just why it happens and if it’s a true indicator of robust health in our cows. 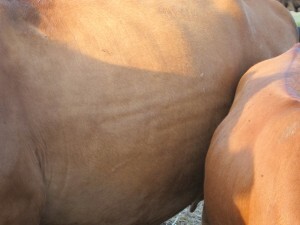 I’ve added a couple of photos of happy lines on our cows and here’s a of links to an article where happy lines are discussed. We are experiencing, along with most of the country, one of the driest, hottest spring through early summer periods I can remember. Conferences, articles and talk among farmers revolve around who is the driest and how to manage through a drought. I thought it might be refreshing to read an article about how to manage heavy stocking rates during the record wet summer being experienced by a farmer in England. Can grass really be that green?? During my career in the electric fencing industry I have worked with many consumers, customers and agencies regarding cost share programs. There are many programs available, out there. The Environmental Quality Incentives Program (EQIP) is one of the larger ones, a federal program, and is administered by NRCS. It is a voluntary program that provides financial and technical assistance to agricultural producers. But, besides the federal programs there are also state, regional, and county programs that may offer financial and technical assistance to landowners. Recently we were adding a new cross fence; building a one wire permanent fence using hedge corner posts and PasturePro line posts and 12.5 gauge high tensile wire. It was a short section [660ft] and took us less than two hours to complete. It never ceases to amaze me how quickly fence like this, with an expected 30 year life, takes to build.